ViXS new XCode 6400 SOC (System-on-Chip) will make it easier for manufactrers to solve complex processing problems related to Ultra HD 4K (3840x2160) resolutions. With the XCode 6400 manufacturers have a simple solution when it comes to how to process system-intensive tasks such as transcoding and video streaming. Overall, the XCode 6400 will help make the upcoming Ultra HD transition easier and less expensive on manufacturers and consumers. The future of Ultra HD content distribution and display begins...now. ViXS Systems Inc. (VXS.TO), a pioneer and leader in media processing silicon solutions, today announced that it is now shipping its groundbreaking XCode 6400 System-on-Chip (SoC) for the service provider and consumer electronics markets. 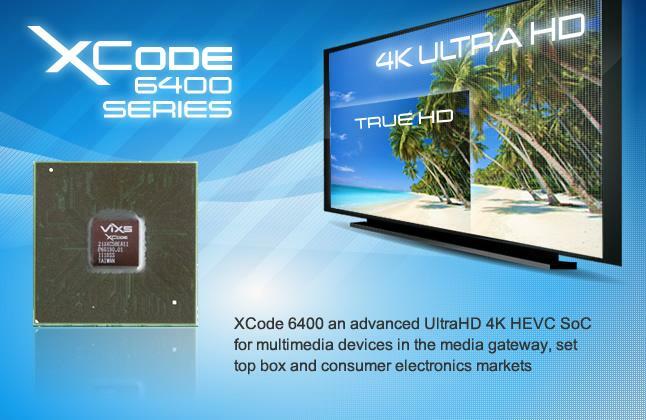 The XCode 6400 is the first SoC to successfully support High Efficiency Video Coding (HEVC) Main 10 Profile - helping drive the transition to Ultra HD 4K across the entire content distribution value chain. Samples of the XCode 6400 are available immediately. Production shipments begin in January 2014 , and ViXS has booked orders for delivery in February and March. Leveraging the XCode 6400's unique processing architecture, equipment manufacturers are now free to design new products that push the boundaries of performance and feature ultra-low power consumption with sleek form factors. With the processing power to handle today's software-intensive networking, display and streaming services, the XCode 6400 empowers manufacturers to meet surging demand for 4K products and take advantage of the incredible color depth and picture clarity of 10-bit media. The XCode 6400 SoC can decode HEVC-based content and display resolutions up to Ultra HD 4K (3840x2160 pixels) at a full 60 frames per second. ViXS was the leading proponent of 10-bit media processing during the HEVC standards process, and an active contributor to the formation of the technical specifications. The higher color bit depth allows for smoother color transitions in video, resolving color-banding issues, and brings more than 1 billion colors to life in Ultra HD. ViXS' flexible, industry-leading XCode architecture enables customers to take full advantage of its patented real-time media processing and off-loading capabilities. The media-processing hardware cores offload functions such as transcoding, video streaming, and audio processing, resulting in a chip that is more cost effective, more processing efficient, and draws less energy when compared to other architectures relying on central processing unit (CPU), digital signal processing (DSP) and/or graphics processor unit (GPU) technology. The difference between Ultra HD and 4K resolution explained at HomeTheaterReview.com. Read more about ViXS at HomeTheaterReview.com.